The shoulder joint is a ball and socket joint. The round end of the upper arm bone (head of the humerus) fits into the shallow socket (glenoid) on the shoulder blade (scapula), much like a golf ball rests on a tee. 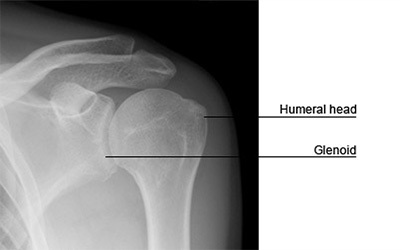 A ring of cartilage surrounds the shallow socket of the shoulder joint (glenoid). This ring is called the ‘labrum’. The ‘glenoid labrum’ increases the depth of the socket, making the shoulder joint more stable. To the upper or superior part of this labrum (i.e. approximately the 12 o’clock position of the labrum), attaches the tendon of the biceps muscle (called ‘the long head of the biceps’). This long tendon of the biceps then passes over the head of the humerus, into the arm. The injury usually occurs after a fall on an outstretched hand, a direct blow on the shoulder or because of repetitive overhead movements over years, such as throwing sports. The area of the upper labrum has a poor blood supply, and it is one of the reasons it is susceptible to injury. Superior labral tears are also associated with shoulder dislocations. The usual symptom is of shoulder pain, usually after an overhead activity (throwing a ball) or on loading the shoulder (bench press ups). The pain is felt deep within the shoulder and the shoulder may feel ‘unstable’. The pain can become constant. Patients may feel a painful click with shoulder movement. SLAP injury is often associated with other injuries in the shoulder (rotator cuff injuries). After appropriate clinical assessment, an MR arthrogram will be advised. A dye is injected into the shoulder and a magnetic field is used to create cross sectional images of the shoulder. The MRI scan will also diagnose other associated injuries (see picture below). Treatment with physiotherapy can be attempted, but most symptomatic SLAP injuries will not respond well. As stated earlier these injuries are accompanied by other injuries that need treatment. Arthroscopic (key hole) surgery is the surgical treatment of choice in patients with symptomatic SLAP injuries. About 2-3 incisions of ½ cm to 1 cm are needed and a telescope is passed into the shoulder through one of these incisions. Special surgical instruments are passed through the other incisions. The injury is initially assessed and graded. There are 4 grades described and further treatment of the injury depends on the grade of injury. The advantage of keyhole surgery is that it is less traumatic and so recovery is quicker. It is usually carried out as a day procedure. Loss of movement of the shoulder is rare after arthroscopic repair. Debridement of the SLAP tear: If the tear is small and at the edge of the labrum, the loose portion of the labrum is trimmed to a smooth edge. Arthroscopic repair of the SLAP tear: With this surgery, the upper part of the labrum is repaired and reattached to the bone by using special suture anchors. This type of surgery is practised for tears that are unstable. Arthroscopic tenodesis of the biceps tendon: With this surgery, the tendon attached to the upper part of the labrum is cut and reattached to the upper humerus. The principle behind this surgery is that the tendon will not pull on the torn labrum and the symptoms will improve. This surgery is practised in degenerative, unstable SLAP injuries. If the above conditions are not treated it is likely that the symptoms will persist. It may be that the shoulder will become less troublesome if activities that cause the problems are stopped. Surgical treatment for isolated SLAP injury has a more than 80% success rate. Loss of movement is possible. Damage to the nerve or blood vessels is possible. The operation may fail to improve the symptoms and the repair may not heal. It is important to remember that at the operation, the torn ligament has been reconstructed. The shoulder will be protected in a sling after the operation and the physiotherapist will supervise rehabilitation of the shoulder after the operation. It is very important that the instructions are followed. Generally you will be able to return to a desk job within 4 weeks of the operation and perform reasonable tasks with the limb within 4-6 weeks. You will be unable to drive for a period of 6-8 weeks after arthroscopic repair and activities like golf and racquet sports are best avoided for at least 3 months. Contact sports can be resumed between 4-6 months. These recommendations will vary from patient to patient.